Slots odds are the probabilities of getting a winning combination on the reels. They depend on the type of slot machine you play. Originally the odds were very easy to calculate as the only thing the players had to consider were the number of reels and the symbols used on each of the reels. As a result, the 3-reel slot machines are traditionally believed to be better for player's winning chances, and thus the more reels and symbols on them, the lower a player's advantage. However, the number of symbols on the reels can differ from machine to machine, and that is why the slots odds are different. Here we look at some more examples of slot machines containing 3 and 5 reels each with different number of symbols on them - for these examples: 20, 22 and 25. The slots payback or return is the amount of money the slot machine pays out as winnings, against the total number of credits wagered by players. The payback is always shown in percentage. 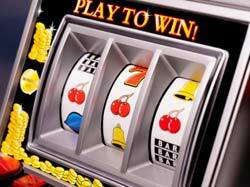 The main idea behind counting the odds in slot machines lies in understanding how the machine pays out money. Unlike what many people believe, not everything is random in a slot machine. Slots are programmed to pay out a certain percent of the money put in with each play. For example, one machine may pay back 80% of bets while another one may pay back 91% and even 100%. This means that for every dollar put in the machine the casino takes 9 cents and pays out 91 cents. But it does not do it for every dollar put in, it just pays out explosively and this is what makes the game so great. Loose slots are slot machines that are programmed to return 82-98% of the wagered money, or even more if you play slots online. As a rule, high-denomination slots pay out more than those offering, for example, $0.05 or $0.25 bets. For more about typical paybacks on different slot machines please read the strategies page. Tight slots are machines that pay out less than 80% and sometimes down to 50% of the wagered money. To avoid playing at these slot machines try not to gamble in motels, airports, bars, gas stations, etc. The payback percentages vary from casino to casino and that is why it may be difficult to find the best machine in the gambling hall. SIGN UP FOR NO DEPOSIT SPINS! © 2019 ⭐SlotsDoc⭐ Inc. | All Rights Reserved. NEW CUSTOMERS ONLY.